One of the advantages of working from home is being able to enjoy the summer weather so I decided to take full advantage by obtaining quotes to have part of my garden decked. Subsequently, I contacted four contractors but as is the case here in Britain only two bothered to turn up. I selected the company I had previously used for a small fencing job and as they had appeared to be fairly efficient arriving early, bringing along surplus timber just in case and speeding through the job. However, as he initially said he wouldn’t be able to start the job for some weeks I was amazed when he turned up one morning unexpectedly and told me that he’d had a cancellation and was able to start. A bit flustered I reluctantly agreed and that was when he asked me for an advance to pay for the timber delivery. Now that should have been the first red light but he was a small business and he had been very vocal about his marriage break up and child custody problems, so we agreed that he could have access from early the next morning. I have to admit to being a tad disappointed that he didn’t arrive until mid-morning the next day citing family problems. It was then I noticed he was on his own carrying all his tools in a supermarket carrier bag so I enquired about his partner to be informed that he had left and was now working alone. I have to admit to being very concerned at this point but as I had paid for the timber I felt that I had to run with it but later that morning I was horrified when he asked which bus he should catch to the local hardware store as he had run out of screws. The job progressed but I was seriously disappointed, it sloped and when it was finished it looked like something a first year woodwork student had cobbled together totally lacking the professional finish which I had asked for. 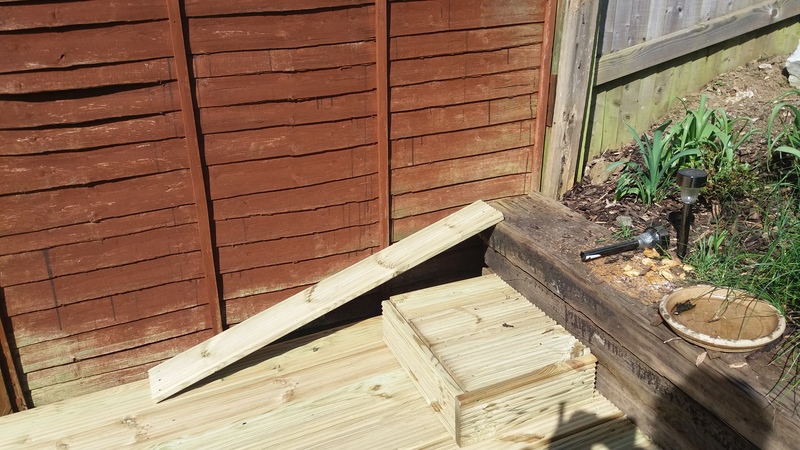 The two steps I specifically requested onto the garden sleepers with incorporated ramp for my hedgehog visitors which I had provided a sketch for was frankly an amateurish eyesore and I had received a handful of splinters from the handrail alone. I realised that the works displayed on his website were clearly earlier projects when he’d been working alongside his former colleague or “borrowed” from google along with the reviews. The final straw was when he asked if I could lend him a level so I ordered him off site. Barbs, my bestie, told me to have a couple of vodkas as it would look better in the morning; it didn’t!